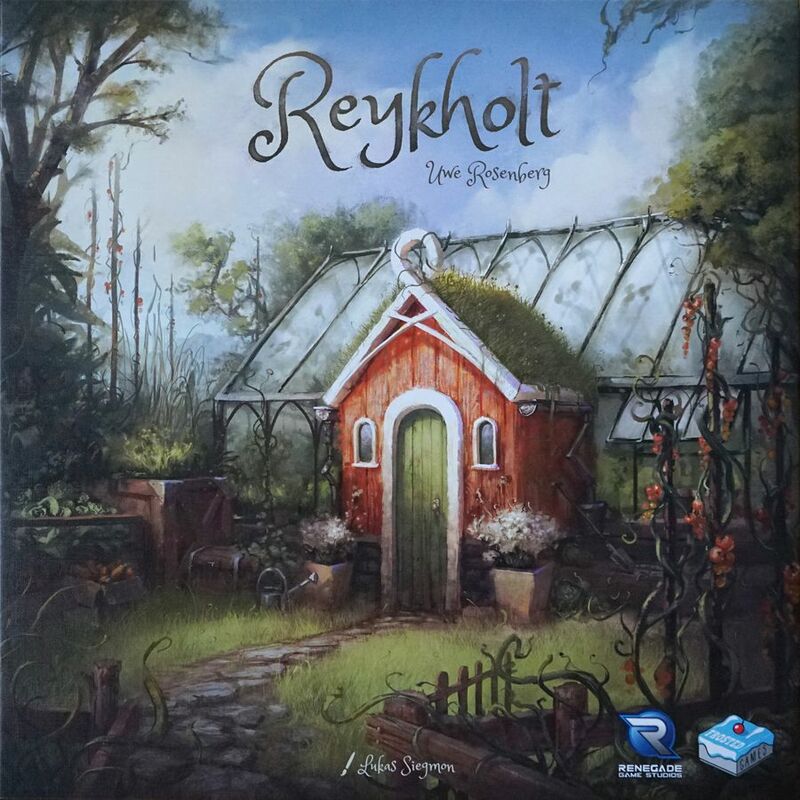 Reykholt is a game by Uwe Rosenberg, published by Renegade Game Studios. It is for 1-4 players. In this game, players take on the role of vegetable farmers in Iceland as they try to grown the most delicious vegetables in their greenhouses, all while fulfilling the orders of the hungriest of tourists. In the end, the player that can serve the most tourists and prove they have what it takes to thrive in this harsh environment will be declared the winner. To begin, the board is placed in the middle of the play area. There are two sides to the board. One for 1-2 players and the other side for 3-4. The side that matches the player count is the one that should be placed face up. In a 2 player game, the covering tile is placed above the board with the book side face up. 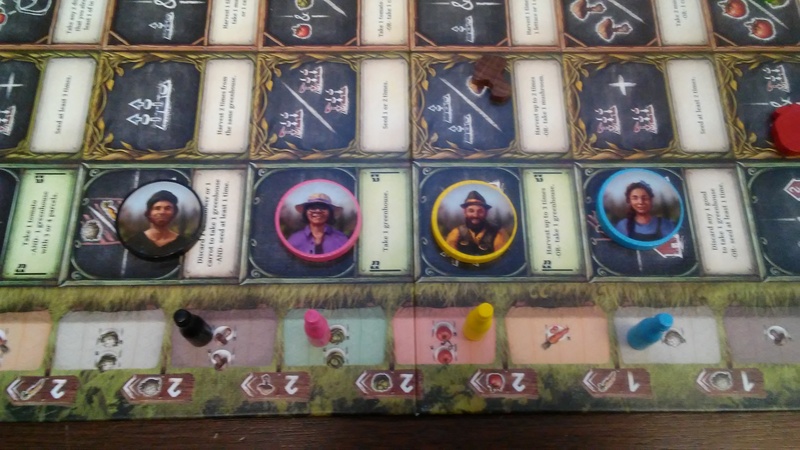 In a 3 player game, the covering tile is placed on the top row of actions on the board with the book side face down. In a 4 player game, the covering tile is not used. The greenhouse cards are gone through and all the cards that are marked with player icons that are greater than the number of players are removed and returned to the box. The remaining cards are then separated into stacks based on the number of parcels on the back of the card. The stacks are placed in a row beside the board face up. For the random greenhouse card stack with the question mark on the backs of the cards, the card with the red arrow symbol is set aside. The rest of the random cards are shuffled together and placed face up in the row with the others. The red arrow symbol card is placed on top of this stack face down. Next a set of service cards must be chosen. For the first game, it is recommended to use the cards from the A deck. The chosen deck is shuffled together and 5 random cards are selected and placed face up next to the board in a row. The remaining service cards are returned to the box. The game round tiles are placed in ascending order with the 7 tile on the bottom and the 1 tile on the top. These are then placed on the appropriate space on either the board or the covering tile. All of the wooden goods are placed in their corresponding goods box, which is placed near the board and is known as the supply. A mushroom, lettuce and tomato are taken from the boxes and placed in a stack at the end of the row of service cards with the tomato on top and the mushroom on the bottom. Players will now choose a color and take the corresponding worker discs, manager bottle and player card in their chosen color. The first player is chosen and is given the start player card. Each player will now place their manager bottle on the starting table of the tourism track of the board. The bottles should be placed with the first player closest to the next table and continuing in turn order to form a row. Once all this has been taken care of, play now begins. The game is played over 7 rounds. Each round is divided into 4 phases or times; Work Time, Harvest Time, Tourism Time and Homecoming Time. The first phase or time is called Work Time. In this phase, players will take turns placing one of their workers onto an action space on the board that doesn’t have any other player’s workers on it. This is also known as a free action space. This is done in turn order starting with the first player and continues until each of the players have placed all 3 of their workers. When the player places their worker on a space, they will immediately perform the action of that space. It should be noted that a player may only place their worker on a space if they are able to perform at least 1 of the actions on that space. However, the player must perform all the actions on that action space if possible. Each action space is part of a column that pertains to a particular type. There are Property actions, Field actions, Market actions and Townhall actions. In each column of the Property and Townhall actions there are a few actions that have been marked with a flag. Each round, players are only able to take 1 of these flag action spaces in a column. Before moving to the next phase, let me mention one of the key terms that players will see fairly regular. That term is seed. Basically this means that when the player takes an action with this key term, they will then take 1 good from their stock and place it on one of the parcels of an empty greenhouse that they have in front of them. It should be noted that the greenhouse must be empty to seed. Each greenhouse will also note which goods are able to be planted in that particular set of parcels. Once the player has seeded the greenhouse, they will then fill in the rest of the empty parcels in that greenhouse with the same goods, taking them from the supply. The next phase or time is called Harvest time. In this phase, each player will harvest 1 time from each one of their greenhouses. Harvest is another key term. What this means is that the player will take 1 good from one of their greenhouses and move it into their stock. If a player has a greenhouse with different good in it, they must choose which type to take. The third phase or time is called Tourism time. In this phase, each player will take a turn starting with the player furthest ahead on the tourism track and continuing in the order of their position on this track. On their turn, they may advance their manager as many tables as they want and can afford to by paying goods from their stock back to the supply. The type of good and amount is noted on the signpost for that particular table, as shown on the board. Each player also has a special bonus function that they must take once per round. This bonus allows the player to take the goods shown on the signpost into their stock, instead of paying it to the supply. It should be noted that when advancing on the tourism track, if the player’s manager advances to a table where there are other managers already, then the player will place their manager ahead of all the others, placing it at the front of the table. Also of note, if a player happens to finish the entire tourism track, then they will move their manager back at the start and continue moving forward in that direction. However they must now add 6 goods of that particular type to continue advancing on the track. The final phase or time is called Homecoming time. In this phase, each player will take back all of their worker discs from the board, placing them in front of themself again. The topmost round tile is then flipped over into the discard pile beside the stack. The start player will then pass the start player card to the next player in turn order. The game continues until the final game round tile has been discarded during Homecoming time. Players will then check the tourism track and the player that is furthest on that track is the winner. This game has some truly beautiful artwork and a whole host of great looking pieces as well. The board is quite large and double sided. One side is for 1-2 players, while the other side is for 3 and 4 players. All the text and inconography on the board is very easy to understand. The artwork is very detailed and amazing. I really like how the board just draws you into it. The covering tile fits in with the board and has some more great looking artwork on one side and a copy of the book design that makes a place for the round tiles for certain numbers of players. Speaking of the round tiles, I like how each one of these cardboard pieces looks like the pages of a book with art and writing on it. These are a great touch that adds lots of color to the game world. Another set of components that are made of cardboard are the goods tiles. These can be used to take the place of 3 of the normal wooden goods. These just help with managing the resources so that there are enough left in the supply for everyone. The final cardboard pieces are the goods boxes that must be assembled prior to playing the game. These fit together quite nicely and securely and add a lot of thematic goodness to the overall look of the game. They hold the wooden goods quite nicely. Speaking of goods, there are 5 different types of wooden goods that are brightly colored and shaped just like the vegetable they are meant to represent. There are brown mushrooms, green lettuce, orange carrots, white cauliflowers and red tomatoes. I have to say, these are a lot bigger than what I thought they’d be when I first saw the game online. I really love the look and feel of these. They really impressed me. Also made of wood are the brightly colored worker discs and managers. The managers are shaped like a bottle. I’m not sure if the bottles were supposed to represent ketchup or wine. For me, I went with ketchup. The discs and bottles match the player’s colors which also shows up in the 4 player cards. There are also stickers for the worker discs. The clothing for the workers matches the colors of the worker discs. I would like to mention that there was a small issue with one of the colors though. While the blue, yellow and black stickers matched perfectly, the pink disc didn’t match the stickers. In fact, the clothing looked more purple than anything. It wasn’t a really big deal but just something that needs pointing out. The game also comes with some really large cards that are almost tarot sized. The artwork on these are all really great. There’s the start player card that has a big garden trowel with the number 1 on it. This is a really cool looking piece of art that really fits the theme. The same can be said with the rest of the cards from the player cards, greenhouse cards, service cards and story mode cards. Each card has a nice linen finish that I love. When everything is set up and ready to go, this game is an absolute beauty to behold. This is definitely one of the best looking games that I’ve seen this year. There’s a lot to love with the components. Trust me, this one does not disappoint at all. The rulebook for this game is absolutely great. It’s big and easy to read. The larger text is especially great for my aging eyes. The book is full of beautiful looking pictures and easy to follow examples of gameplay. The book includes a great double page spread explaining how to set up the game with plenty of pictures to make sure that you have everything in the right place. The rules are laid out quite simply in an easy to follow way. Every phase and step is explained really well. The book even goes over the key terms of the game so that you know what each one means when playing the game. The book also includes some clarifications on certain action spaces and service cards. This is a nice addition, even though everything is pretty easy to understand without it. Also included in the rulebook are two gameplay variants. There are rules for solo play as well as for story mode. I will go into a bit more detail of these variants in the gameplay section. For now, it’s just really nice to have these additions to the rules. Needless to say, I am actually quite thrilled with the overall look and feel of the rulebook. It’s really well put together and looks good in the process too. Definitely one of the better rulebooks that I’ve looked through this year. Deck building games have always been my first love, however nipping at their heels are the worker placement games. In fact, my all time favorite game is in fact a worker placement game. Maybe you’ve heard of it, it’s called Lords of Waterdeep. Needless to say when I got a chance to review Reykholt, I jumped at the chance. Let me just start by saying, this is a great game. Each round, you’re taking actions using your workers and harvesting your crops in order to move your manager around the board. That’s pretty much the game in a nutshell. Thing is, there’s so much more to love about this game then just that. As I mentioned in the component section, this is an amazingly beautiful looking game. Every piece is dripping with theme and details that could have been left out, making it look more like Agricola. Which, by the way, this game makes me think of. The thing about this game though, is that it’s a lot easier and doesn’t punish you for making the wrong decision, like Agricola does, plus it doesn’t have the animals and food requirements that you have to keep up with either. This is simply about growing crops in the best way possible. With the variety of service cards, there’s tons of replayability. The game scales really well and offers a variety of actions moving from each different player count. I really like how smoothly and easily it is to play. You’re not going to find yourself agonizing over where to place your worker, like in other games of this type. Some times you only have a couple of options. Now if the normal game wasn’t enough to get your tractor cranked, then the addition of the solo game and story mode should. The solo mode has you using 2 sets of workers to take actions with. However each round, you will only be using one of the colored sets of 3 workers. On the next round, you leave those workers on the board thus blocking those options for the round. You then use the other 3 workers to take actions with. The goal of the game is to reach the table with 5 tomatoes on it in only 5 rounds. If you go further than that, you gain points for each table you can fulfill past it and for each good you have of those required by the next table. In this way, you can try to beat your own high score. I quite like the solo game. It gives you enough of a taste of the game to really make you want to play with more players, even though the solo game is great by itself. Next there is the story mode. This can be played with any number of players, including solo. Awesome! This gives you new event and service cards as well as presenting 5 different scenarios. Each scenario increases in difficulty, so it’s recommended to play them in order. The event cards will change up different aspects of the game each round, making things quite interesting. Each scenario differs in length, so some games will be shorter than others. Just like with the solo game, I really like this variant too. The fact that it can be played with the solo game makes the solo game even better. This is definitely an amazing game that’s a ton of fun to play. Fans of worker placement games like Agricola or Orléans should really enjoy this game. The game is very simple to play, but is challenging enough for even veteran players, especially when playing the story mode. This is a game that’s family friendly and one that even the kids can play without too much trouble. This is one that I can’t get enough of. I highly recommend this game. Reykholt is a worker placement style game of growing crops and feeding tourists in Iceland. The game isn’t too long. Most game sessions last anwhere from 30 minutes to an hour, depending on the player count. The components are absolutely gorgeous and are a lot of fun to play with. Each piece is dripping with theme and really brings the world of Reykholt to your table. The rulebook is really well designed and is easy to read and understand. The addition of solo rules, as well as rules for story mode are a welcome addition. The game itself is great fun at any player count. From playing solo to playing with 3 other players, this is definitely a lot of fun. The game has a ton of replayability due to the different decks of service cards, as well as the story mode. No matter how you play this one, there’s guaranteed fun to be had. The game is simple enough for younger players but challenging enough for veteran players alike. This is a game that is family friendly and tons of fun for everyone. Fans of worker placement games like Agricola and Orléans should really enjoy this one. No doubt about it, this is one of my most favorite games for the year. I highly recommend this one. Two green thumbs way up. For more information about this and other great games, please check out Renegade Game Studios at their site. 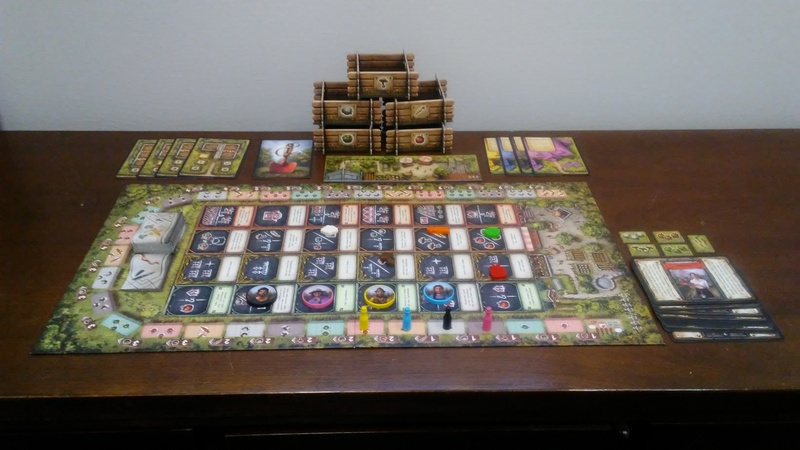 This entry was posted in Reviews and tagged board, board games, card, card games, games, renegade, renegade games, reykholt, rosenberg, uwe, Uwe Rosenberg. Bookmark the permalink.